Running numbers: 3200 - 3228. 1938-39 (3220 - 3228) to lot number 331. The 'Dukedog' or 'Earls' class were in fact rebuilds using 'Bulldog' frames married with 'Duke' boilers. The prototype was 'Duke' number 3265 Tre Pol and Pen, withdrawn in December 1929, which was fitted with the frames of 'Bulldog' number 3365 Charles Grey Mott. Interestingly, when the class was in production, it was initially intended for 3265 to be renumbered 3200 as with previous prototypes, however, it was decided that 3265 would fall into the number sequence at a later date. With the outbreak of World War Two, this chain of events never occurred and so 3265 would remain within the 'Duke' classification. The only difference between 3265 and the production 'Earl' locomotives was the use of 3 feet 2 inches bogie wheels instead of 3 feet 8 inches. The first production batch were fitted with boilers that were either non-superheater or employing the 'one-row' superheater. 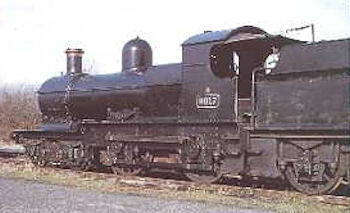 The second batch (3220 - 3228) were fitted with superheaters as standard. In 1946 the whole class was renumbered in the 9000 - 9028 series in the same order as before. With the onset of different operating conditions after World War II, withdrawals began in July 1948 through to 1960. Only one member of the class has been preserved, number 3217 ( ex 9017 ) Earl of Berkeley. Specifications ( with later superheater).